The dear ones signed me up for a CSA box to be delivered throughout the summer. CSA stands for Community Supported Agriculture and supports local farmers and this particular one is all organic. I live in anticipation of what fresh, local treats are going to be left at my doorstep! This week Bartlett pears, Donut peaches, lots of vegetables, and something I had not used before, Lemon Cucumber. The photo shows one in the background. They taste like cucumbers, and they do not taste like lemon, named just for the color. So, this is a Greek like salad, with lemon cucumber and basil. The cucumbers can be peeled or used with the peel, which I did, because they were small and tender. 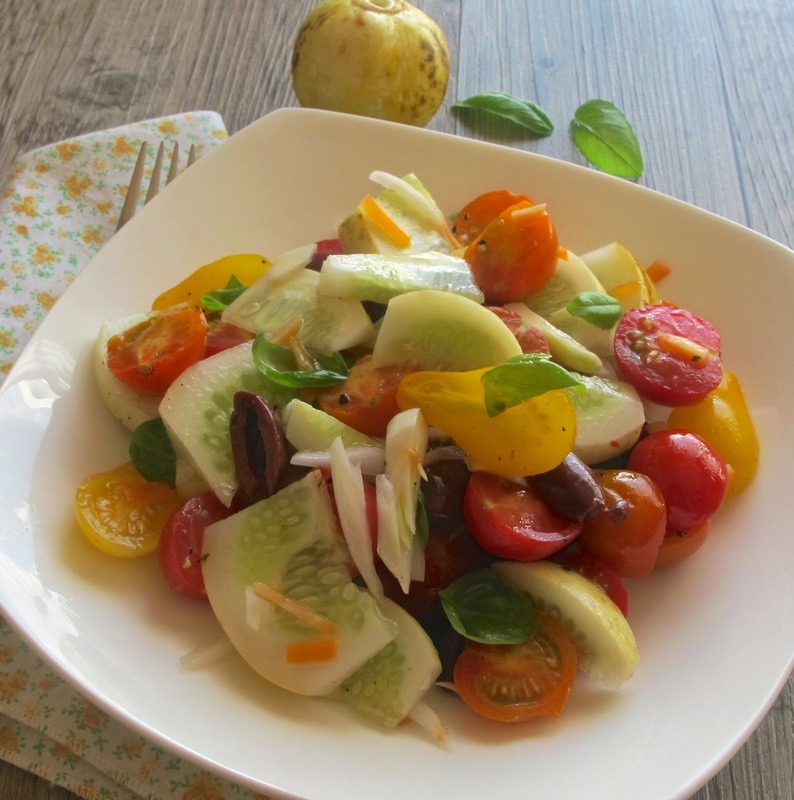 Combine cucumbers, onion, pepper, tomatoes, olive, and basil together in a bowl. In another bowl, whisk together vinegar, olive oil, oregano, and salt. Drizzle 2 Tablespoons dressing over salad and toss. Add pepper and more basil, if desired.